Jim saw his first owl of the season the other morning. He was turning to leave the kitchen, but a flash of movement outside the window caught his eye. Our kitchen windows look out over the backyard, from the garden and the compost bins to the apple trees and the sledding hill. He stopped and looked, just in time to see a barred owl gliding along the forested edge of the yard. Jim kept watching as the great bird flapped its large wings once, and again, then banked into the woods and disappeared from view. Jim was struck by how big the bird was, as he is every time he glimpses one of the owls that inhabit the deep forests around here. He could make out the brown and white bars on the barred owl’s wings that give it its name, although they’re easier to recognize as wide stripes when the bird is sitting still. He’s taught Ursula and Virgil how to mimic its faintly nasal, croaking call, “who cooks for you, who cooks for you-all,” along with the call of the more voluble great horned owl, with its slightly syncopated “whoo-who who-whoooo” rhythm. There’s a full moon this weekend. If the storms that have swung our way this week depart in time, we’ll walk out into the woods, quietly, and call to the owls. If we’re lucky, they’ll call back. In my next post, I’ll list places that host “owl walks” around New England. 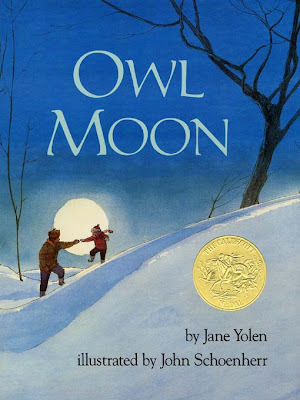 Read about Owl Moon on Jane Yoder's website. Listen to the call of the great horned owl. Listen to the call of the barred owl. Watch a video of Owl Moon.